Visual understanding goes well beyond object recognition. With one glance at an image, we can effortlessly imagine the world beyond the pixels: for instance, we can infer people's actions, goals, and... mental states. While this task is easy for humans, it is tremendously difficult for today's vision systems, requiring higher-order cognition and commonsense reasoning about the world. In this paper, we formalize this task as Visual Commonsense Reasoning. In addition to answering challenging visual questions expressed in natural language, a model must provide a rationale explaining why its answer is true. We introduce a new dataset, VCR, consisting of 290k multiple choice QA problems derived from 110k movie scenes. 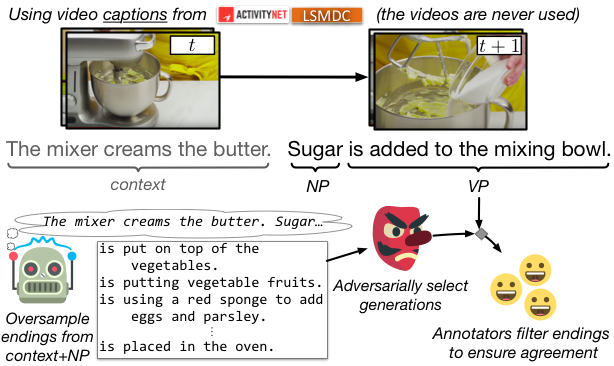 The key recipe to generating non-trivial and high-quality problems at scale is Adversarial Matching, a new approach to transform rich annotations into multiple choice questions with minimal bias. 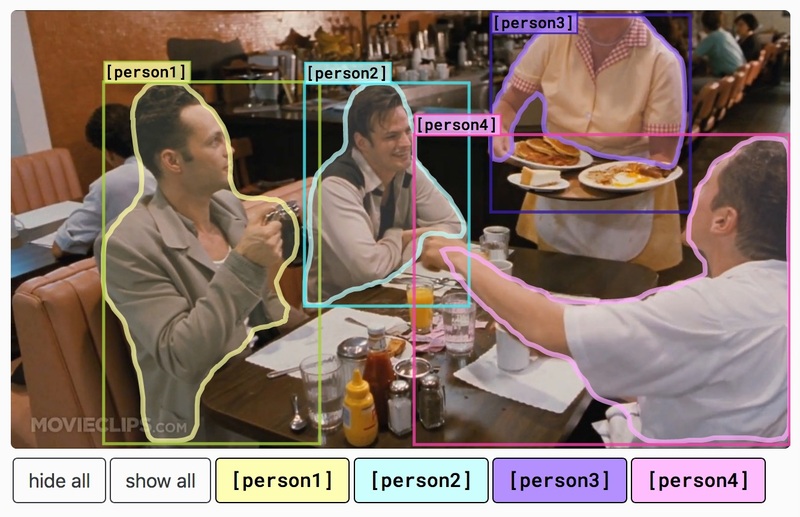 To move towards cognition-level image understanding, we present a new reasoning engine, called Recognition to Cognition Networks (R2C), that models the necessary layered inferences for grounding, contextualization, and reasoning. Experimental results show that while humans find VCR easy (over 90% accuracy), state-of-the-art models struggle (~45%). Our R2C helps narrow this gap (~65%); still, the challenge is far from solved, and we provide analysis that suggests avenues for future work. We present ATOMIC, an atlas of everyday commonsense reasoning, organized through 300k textual descriptions. 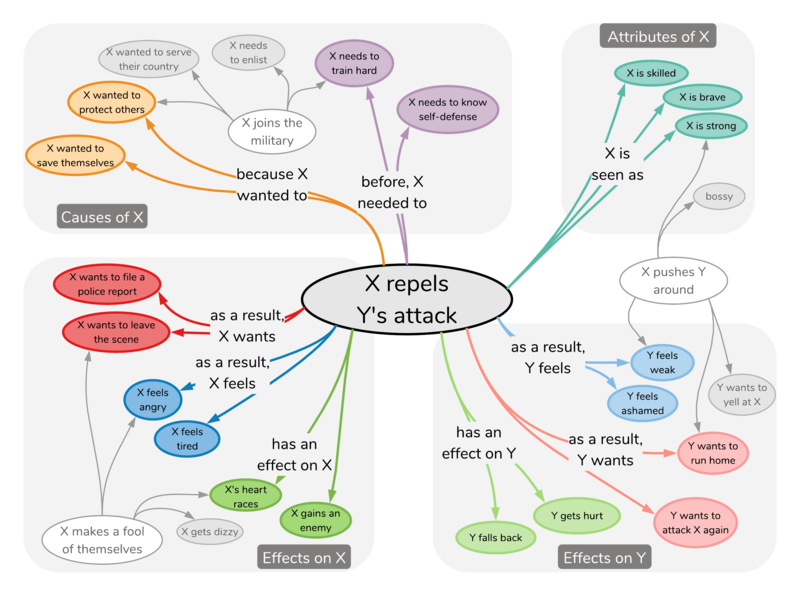 Compared to existing resources that center around taxonomic knowledge, ATOMIC focuses on inf... erential knowledge organized as typed if-then relations with variables (e.g., "if X pays Y a compliment, then Y will likely return the compliment"). We propose nine if-then relation types to distinguish causes v.s. effects, agents v.s. themes, voluntary v.s. involuntary events, and actions v.s. mental states. 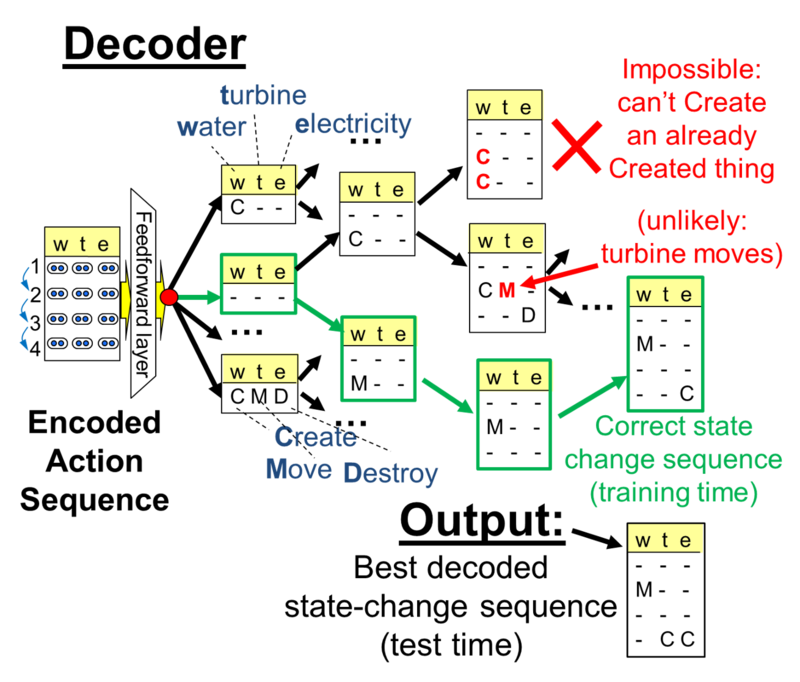 By generatively training on the rich inferential knowledge described in ATOMIC, we show that neural models can acquire simple commonsense capabilities and reason about previously unseen events. Experimental results demonstrate that multitask models that incorporate the hierarchical structure of if-then relation types lead to more accurate inference compared to models trained in isolation, as measured by both automatic and human evaluation. Given a partial description like 'she opened the hood of the car,' humans can reason about the situation and anticipate what might come next ('then, she examined the engine'). In this paper, we introd... uce the task of grounded commonsense inference, unifying natural language inference and commonsense reasoning. We present SWAG, a new dataset with 113k multiple choice questions about a rich spectrum of grounded situations. To address the recurring challenges of the annotation artifacts and human biases found in many existing datasets, we propose Adversarial Filtering (AF), a novel procedure that constructs a de-biased dataset by iteratively training an ensemble of stylistic classifiers, and using them to filter the data. To account for the aggressive adversarial filtering, we use state-of-the-art language models to massively oversample a diverse set of potential counterfactuals. Empirical results demonstrate that while humans can solve the resulting inference problems with high accuracy (88%), various competitive models struggle on our task. We provide comprehensive analysis that indicates significant opportunities for future research. Comprehending procedural text, e.g., a paragraph describing photosynthesis, requires modeling actions and the state changes they produce, so that questions about entities at different timepoints can b... e answered. Although several recent systems have shown impressive progress in this task, their predictions can be globally inconsistent or highly improbable. In this paper, we show how the predicted effects of actions in the context of a paragraph can be improved in two ways: (1) by incorporating global, commonsense constraints (e.g., a non-existent entity cannot be destroyed), and (2) by biasing reading with preferences from large-scale corpora (e.g., trees rarely move). Unlike earlier methods, we treat the problem as a neural structured prediction task, allowing hard and soft constraints to steer the model away from unlikely predictions. We show that the new model significantly outperforms earlier systems on a benchmark dataset for procedural text comprehension (+8% relative gain), and that it also avoids some of the nonsensical predictions that earlier systems make. Understanding a narrative requires reading between the lines and reasoning about the unspoken but obvious implications about events and people’s mental states — a capability that is trivial for humans... but remarkably hard for machines. To facilitate research addressing this challenge, we introduce a new annotation framework to explain naive psychology of story characters as fully-specified chains of mental states with respect to motivations and emotional reactions. Our work presents a new large-scale dataset with rich low-level annotations and establishes baseline performance on several new tasks, suggesting avenues for future research. 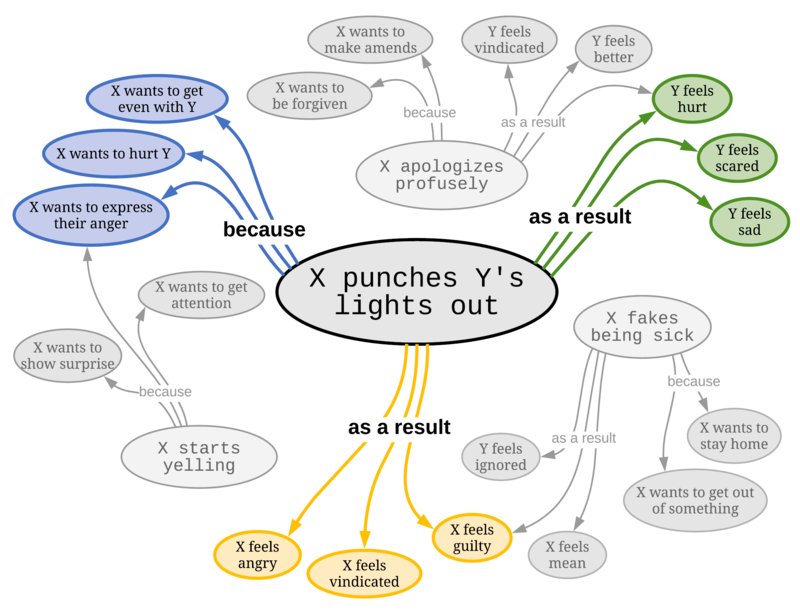 We investigate a new commonsense inference task: given an event described in a short free-form text ("X drinks coffee in the morning"), a system reasons about the likely intents ("X wants to stay awak... e") and reactions ("X feels alert") of the event’s participants. To support this study, we construct a new crowdsourced corpus of 25,000 event phrases covering a diverse range of everyday events and situations. We report baseline performance on this task, demonstrating that neural encoder-decoder models can successfully compose embedding representations of previously unseen events and reason about the likely intents and reactions of the event participants. In addition, we demonstrate how commonsense inference on people’s intents and reactions can help unveil the implicit gender inequality prevalent in modern movie scripts. Despite their local fluency, long-form text generated from RNNs is often generic, repetitive, and even self-contradictory. We propose a unified learning framework that collectively addresses all the a... bove issues by composing a committee of discriminators that can guide a base RNN generator towards more globally coherent generations. More concretely, discriminators each specialize in a different principle of communication, such as Grice’s maxims, and are collectively combined with the base RNN generator through a composite decoding objective. Human evaluation demonstrates that text generated by our model is preferred over that of baselines by a large margin, significantly enhancing the overall coherence, style, and information of the generations. Understanding procedural language requires anticipating the causal effects of actions, even when they are not explicitly stated. 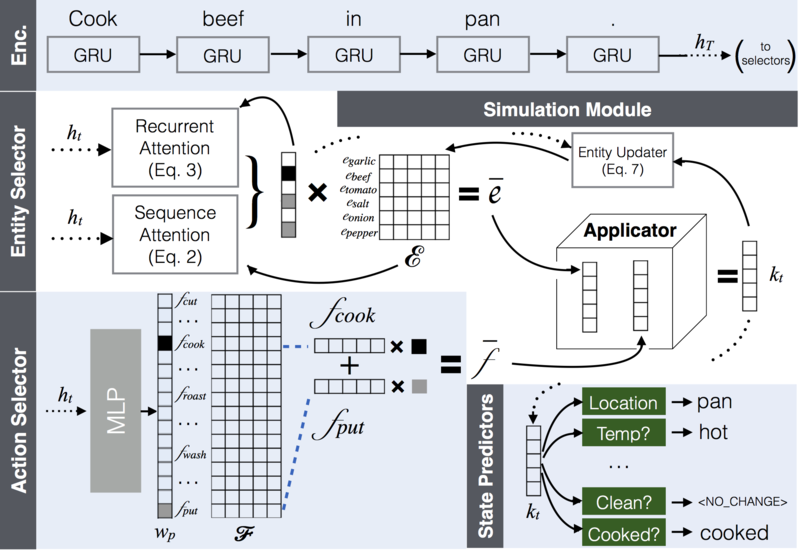 In this work, we introduce Neural Process Networks to understand proced... ural text through (neural) simulation of action dynamics. Our model complements existing memory architectures with dynamic entity tracking by explicitly modeling actions as state transformers. The model updates the states of the entities by executing learned action operators. Empirical results demonstrate that our model can reason about the unstated causal effects of actions, allowing it to provide more accurate contextual information for understanding and generating procedural text, all while offering interpretable internal representations. 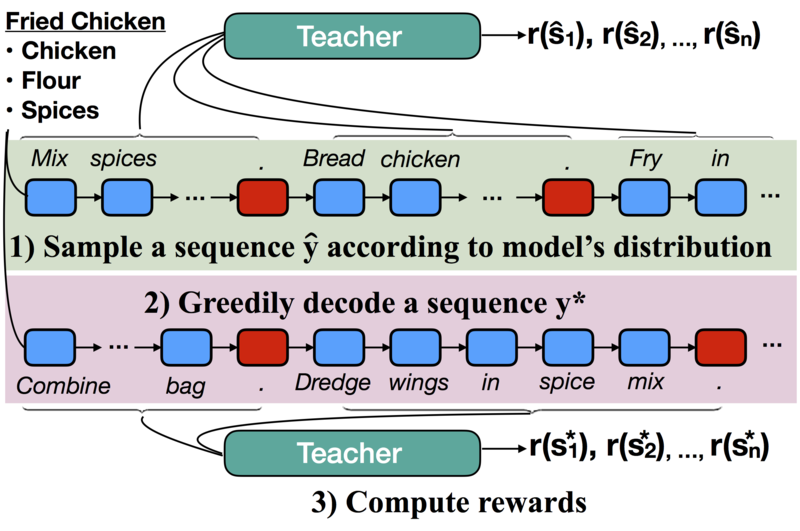 In this paper, we investigate the use of discourse-aware rewards with reinforcement learning to guide a model to generate long, coherent text. In particular, we propose to learn neural rewards to mode... l cross-sentence ordering as a means to approximate desired discourse structure. 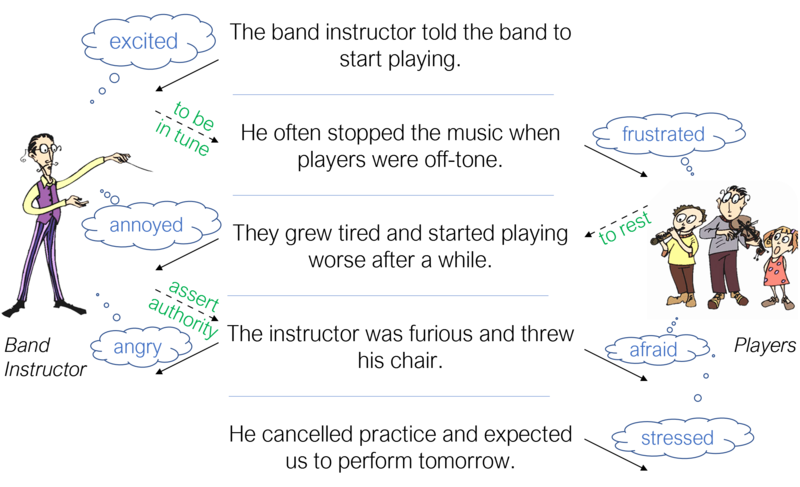 Empirical results demonstrate that a generator trained with the learned reward produces more coherent and less repetitive text than models trained with cross-entropy or with reinforcement learning with commonly used scores as rewards. We present deep communicating agents in an encoder-decoder architecture to address the challenges of representing a long document for abstractive summarization. With deep communicating agents, the tas... k of encoding a long text is divided across multiple collaborating agents, each in charge of a subsection of the input text. These encoders are connected to a single decoder, trained end-to-end using RL to generate a focused and coherent summary. 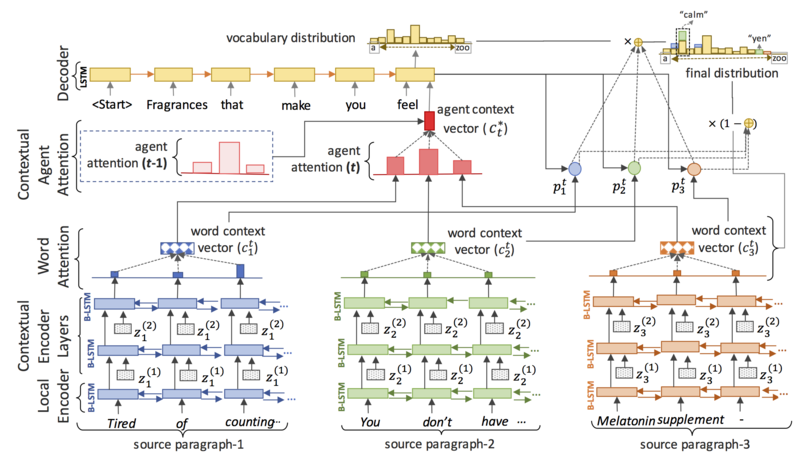 Empirical results demonstrate that multiple communicating encoders lead to a higher quality summary. No papers matched your criteria.